Well how was that for the start of a new intermediate cycle? While many analysts were calling for continued losses or even a market crash I repeatedly warned traders that an intermediate degree bottom was coming and that markets routinely rally violently out of those bottoms often generating 5-8% gains in the first 12 to 15 days. This particular intermediate bottom has already gained 5% in the first five days. Like I’ve been saying all along, I think the market will easily make new highs in the next two or three months, possibly even significant new highs, or a test of the 2007 top as QE3 starts to work it’s magic. 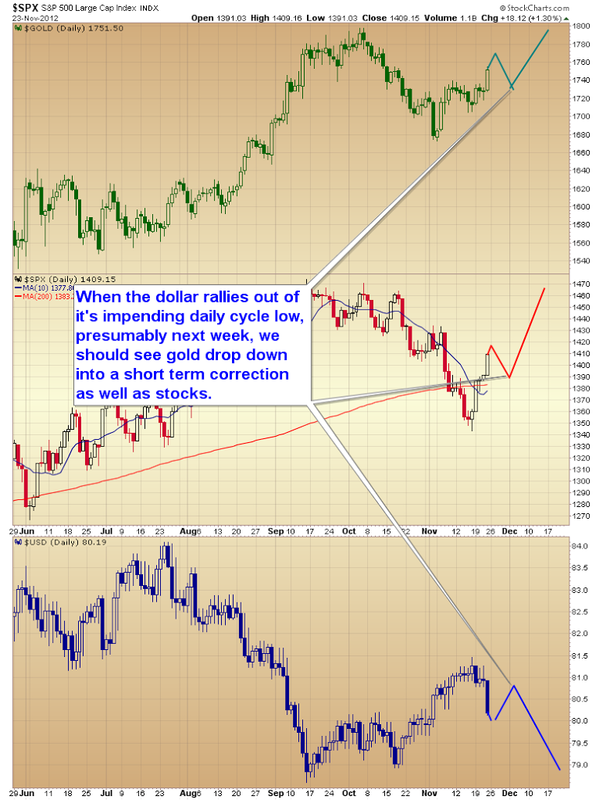 That being said stocks and gold are now due for a short-term breather. 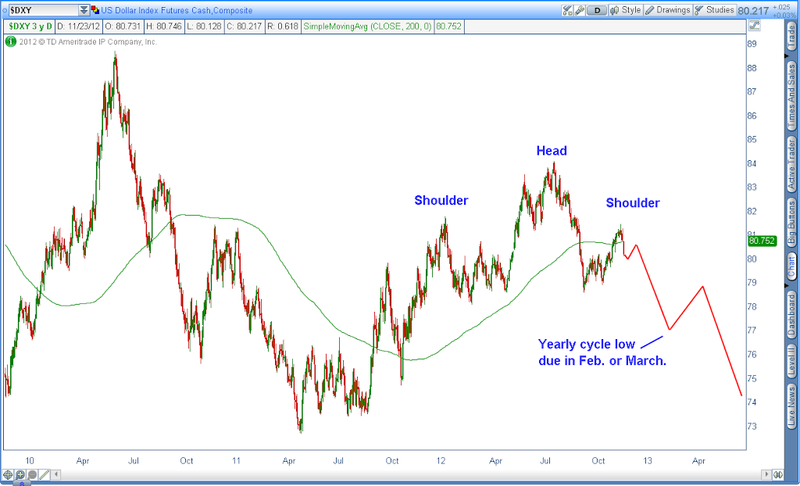 Why is that you ask, if all markets have just formed major intermediate cycle lows? 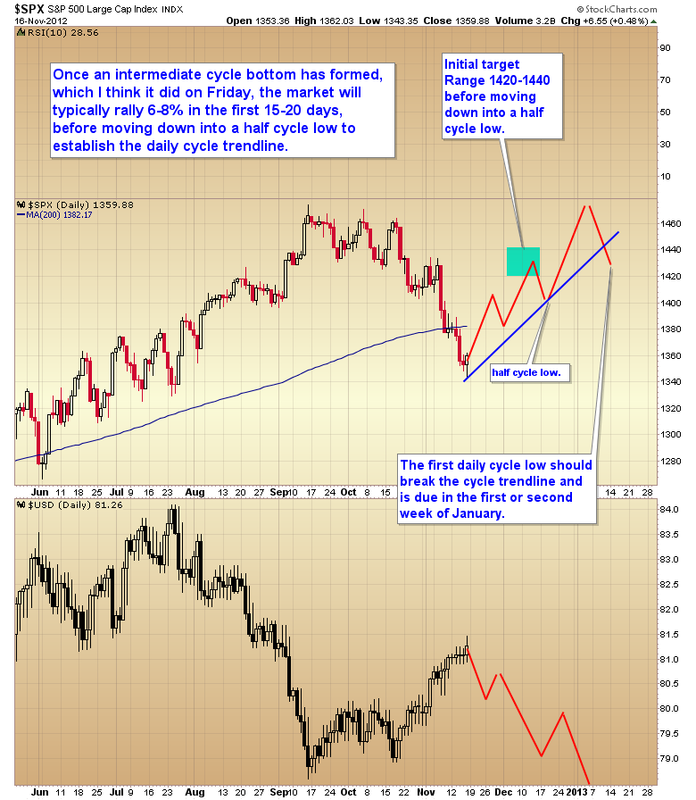 The reason has to do with the daily dollar cycle. Friday marked the 24th day in the current daily cycle. That cycle generally runs about 18-28 days trough to trough. 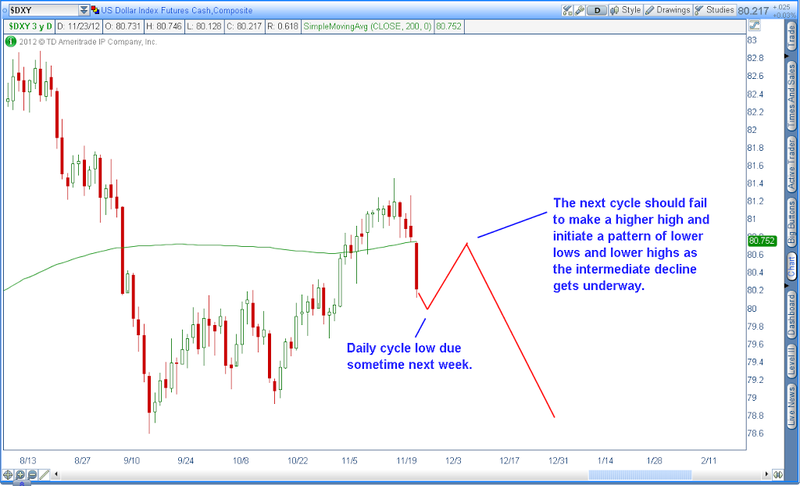 At 24 days the cycle is well into the timing band for a bottom and bounce. That bounce should force stocks into a short-term correction, or sideways consolidation, and gold into its next daily cycle low. However don’t be fooled by any short-term corrective move as stocks and gold have all clearly formed major intermediate bottoms. There are always corrective moves along the way, nothing goes straight up, but intermediate cycles don’t usually form a final top until sometime around week 12-15. As last week was only week 1 of a new intermediate cycle, we probably don’t need to look for a final top until sometime in February, or early March. Coincidentally, that is when the dollar is due to form its yearly cycle low. A yearly cycle bottom is the most severe cyclical decline other than a three year cycle low (the next one of those isn’t due until mid 2014). I think we can safely assume that QE3 is going to complete the head and shoulders topping pattern for this particular three year cycle, and just like I said months ago the dollar topped back in the summer when the CRB index formed its final three year cycle low. The dollar should now head generally lower over the next year and a half with brief bear market rallies similar to what we just experienced. 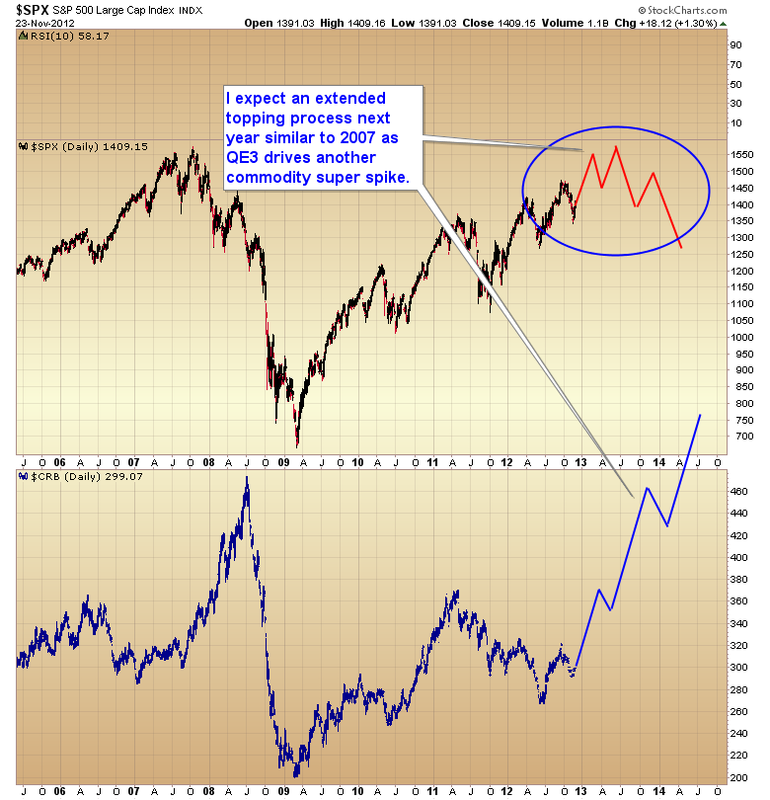 This will drive an inflationary phase that should drive all asset prices higher into mid-2013, and commodities into a super spike in mid-2014 (this is when I expect gold to reach its next C-wave top at roughly $4000). 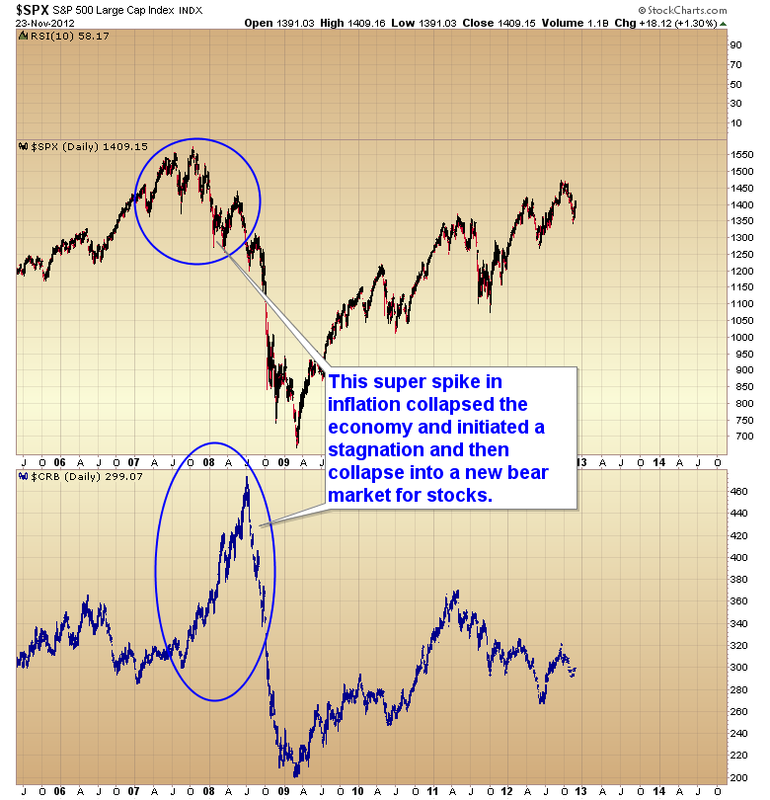 By mid-2013 inflation will start to take its toll on the economy, and stocks will stagnate and begin an extended topping process as inflation continues to surge, similar to what happened in 2007/08. I think we will experience the same phenomenon this time as QE3 eventually generates the same unexpected consequences and spikes commodity inflation. 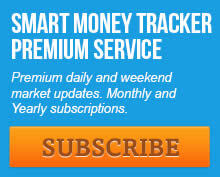 Traders need to be prepared next week for some kind of corrective move. Understand this is not the beginning of another leg down, but a second chance to get positioned for what should be a very profitable intermediate degree rally over the next 2-3 months. This entry was posted in Uncategorized on November 24, 2012 by Gary. I’ve diagrammed the general directions and rough targets for what I think will unfold over the next month and a half in the chart below. However, the dollar shouldn’t put in the true yearly cycle low until sometime in mid February to early March so there should be another leg down after the one bottoming in January. We should continue to see the dollar generally heading lower with intermittent bear market rallies until it puts in a final three year cycle low in mid-2014. This should keep the stock market generally moving higher at least until the point where commodity inflation, especially energy, gets to the point it collapses consumer spending. Once that occurs the stock market will start to stagnate and refuse to rise even if the dollar continues to fall. If Bernanke didn’t learn his lesson in 2008 he will continue to print and spike inflation even higher creating the conditions for the next recession. 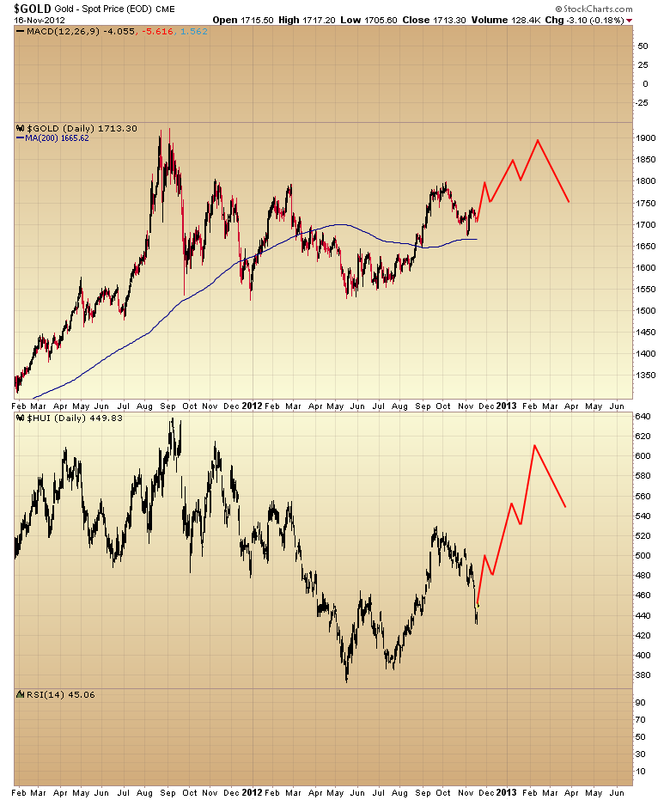 However I think the really big money will be made in mining stocks as gold should rally enough to make it’s first test of the all time highs at $1900. It’s not unreasonable to think miners will follow and test 640 during this time. This entry was posted in Uncategorized on November 19, 2012 by Gary. I’m just going to do a quick post today. 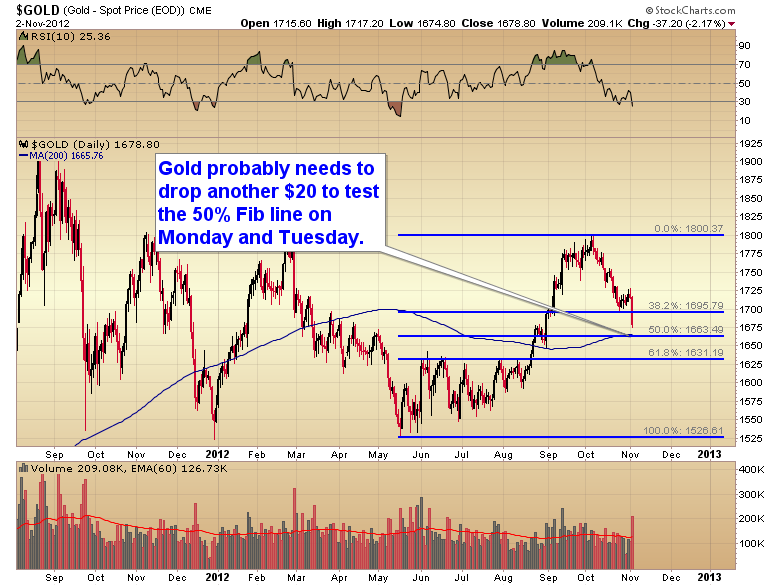 The relevant factors are that gold appears to have put in an intermediate degree bottom last week. 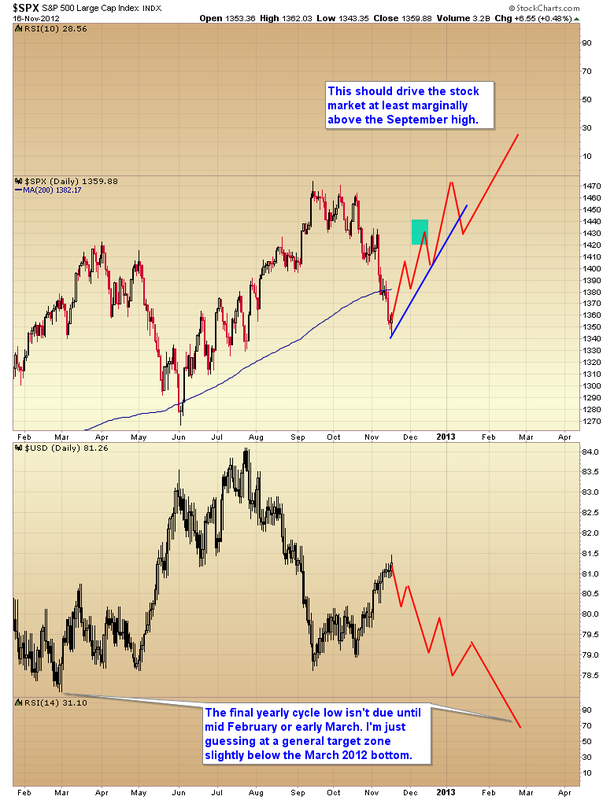 Miners are being dragged down at the moment as the stock market makes its final move into an intermediate bottom. This happens pretty much like clockwork every 20-25 weeks (currently on week 23). 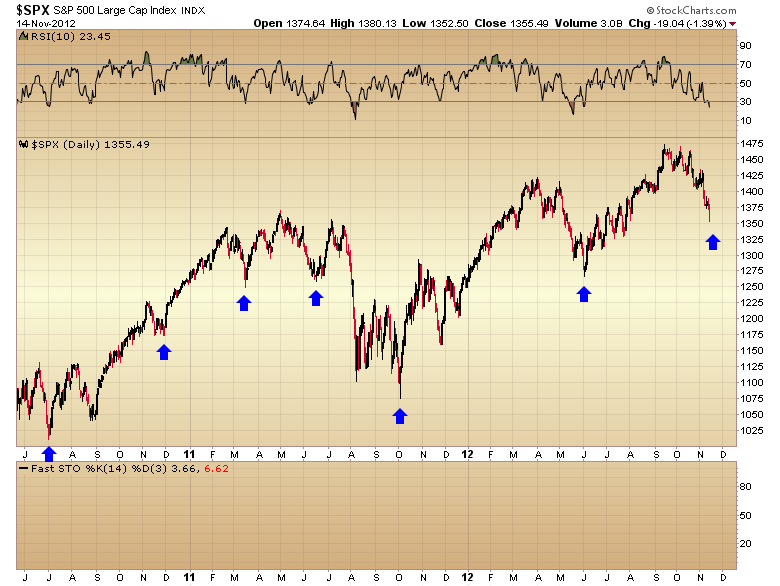 Invariably when stocks move down into one of these major cycle bottoms the selling pressure infects everything. It finally grabbed the miners today even though gold has barely budged. Not to worry though, we’ve seen this happen dozens of times in the past, and the miners always snap back violently once the selling pressure in the stock market exhausts. More importantly than where things are going tomorrow or the next day is where they are headed over the next intermediate cycle. As I have diagrammed in the chart below the dollar is due for a move down into a yearly cycle low around mid February or early March. Roughly the same time as last year. 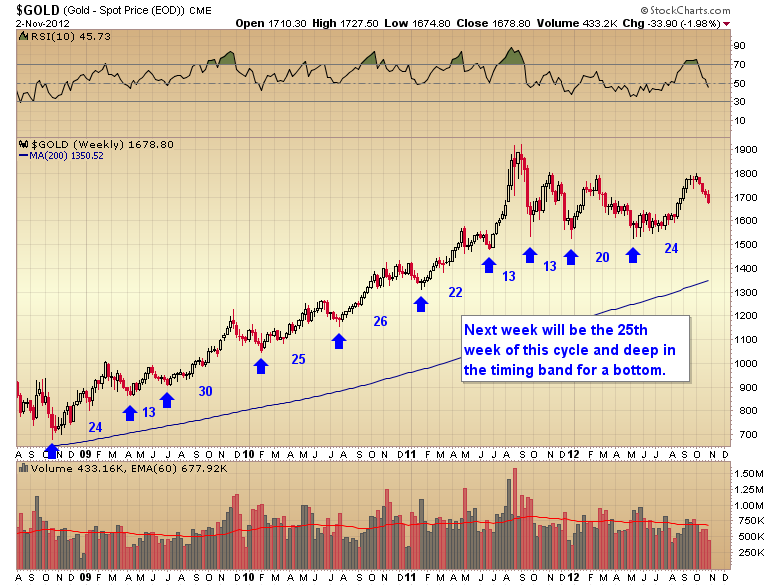 This will drive the next intermediate rally in gold (and stocks) for about the next 12-15 weeks. I’ll say it again. Buying anywhere around these levels will deliver big gains over the next 3-4 months. Probably largest in the miners, but certainly significant in virtually all sectors. 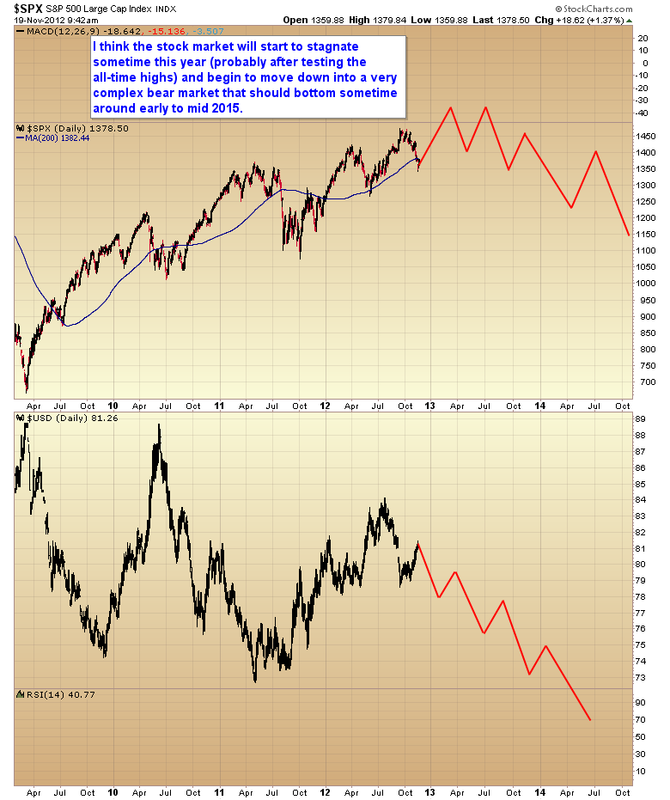 This is that period of time that comes only once or twice a year when the chartists get fleeced (the charts always say the market is going lower at intermediate bottoms. This is why chartists always miss these major bottoms. You need different tools to spot these kind of buying opportunities.) and the smart money positions for the next leg up. This entry was posted in Uncategorized on November 15, 2012 by Gary. 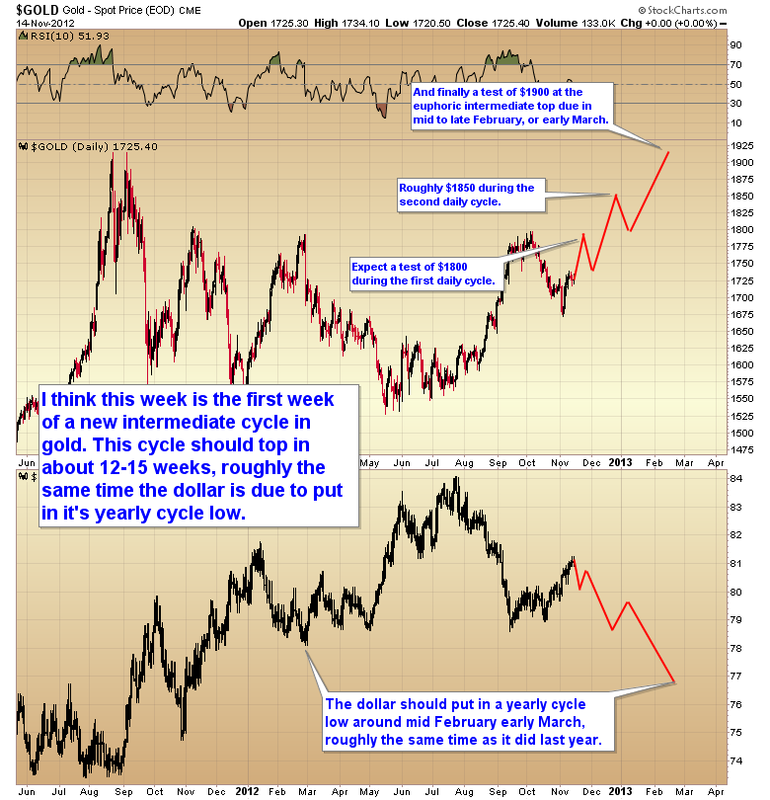 If you aren’t already in, Monday or Tuesday should represent an exceptional buying opportunity as gold moves into it’s final intermediate cycle bottom. Now that the 38% retracement has been breached I would look for a final exhaustion move to test the 50% level early next week as we move into the elections. At that point sentiment should be completely washed out and gold will be set up for an explosive move to test the all time highs by the end of the year or early January. Miners should deliver even bigger gains as I expect them to break out of the bull flag that’s been forming over the last 4 weeks and generate a 25-30% rally to test the all time highs. We are moving into one of those rare buying opportunities that only come around once or twice a year. This is that point that I warned about in my last post where you have to ignore the media and nonsense about QE3 not working. It is going to work, and it is going to work extremely well. 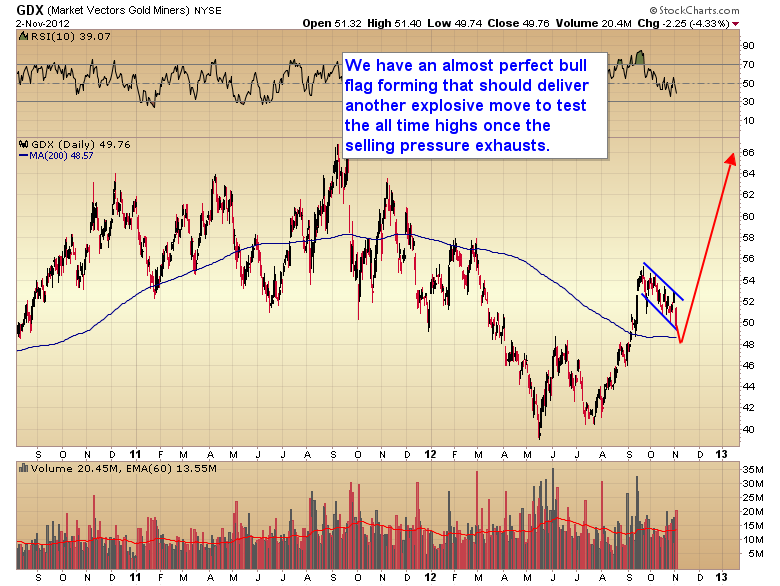 I fully expect it to drive gold to $4000 by mid 2014. This is purely a profit taking event, nothing more. They happen like clock work about every 20-25 weeks, as you can see in the chart below. 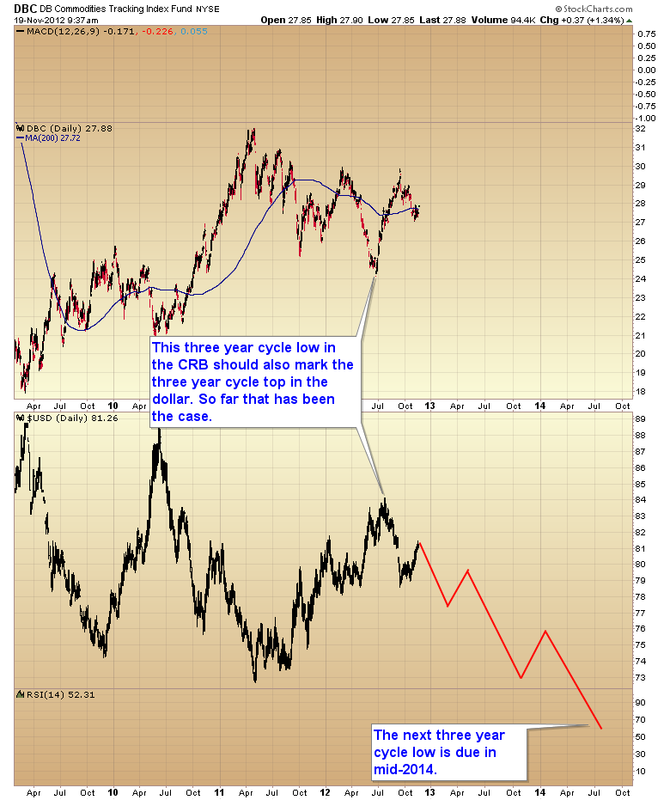 Gold is now very late in the timing band for that major cycle bottom. I’ll have more in the weekend report. But I think the odds are very high we get a final bottom by mid week. This entry was posted in Uncategorized on November 2, 2012 by Gary.